The Android platform provides easy and tight integration between Android applications and Google Maps. The well established Google Maps API is used under the hood in order to bring the power of Google Maps to your Android applications. In this tutorial we will see how to incorporate Google Maps into an Android app. In order to be able to use Google Maps, the Google APIs have to be present in your SDK. In case the Google APIs are not already installed, you will have to manually install them. This is accomplished by using the Android SDK and AVD Manager. Launch the manager and choose the “Installed Options” section to see what is already installed and the “Available Packages” to download the additional APIs. It is important to use the “Google APIs” as the target since this option includes the Google extensions that allow you to use Google Maps. Return to the first step of this tutorial if no such option is available in your configuration. I chose the 1.5 version of the platform since we will not be using any of the latest fancy API stuff. As you might know if you have used the Google Maps API in the past, a key is required in order to be able to use the API. The process is slightly different for use in Android applications, so let's see what is required to do. Note that the process is described in the “Obtaining a Maps API Key” page, but I will also provide a description here. First, we have to calculate the MD5 fingerprint of the certificate that we will use to sign the final application. This fingerprint will have to be provided to the Google Maps API service so that it can associate the key with your application. Java's Key and Certificate Management tool named keytool is used for the fingerprint generation. The keytool executable resides in the %JAVA_HOME%/bin directory for Windows or $JAVA_HOME/bin for Linux/OS X. For example, in my setup, it is installed in the “C:\programs\Java\jdk1.6.0_18\bin” folder. Note that this was executed against the debug keystore, you will have to repeat this for the keystore that will be used with the application you are going to create. Additionally, the application is run on another development environment, with different Android SDK keystore, the API key will be invalid and Google Maps will not work. To extend from MapActivity we have to implement the isRouteDisplayed method, which denotes whether or not we are displaying any kind of route information, such as a set of driving directions. We will not provide such information, so we just return false there. In our map activity, we will just take reference of a MapView. This view will be defined in the layout XML. We will also use the setBuiltInZoomControls method to enable the built-in zoom controls. Do not forget to provide your API key in the relevant field or else Google Maps will not work. The problem is that we haven't notified Android that we wish to use the add-on Google APIs which are external to the base API. To do so, we have to use the uses-library element in our Android manifest file, informing Android that we are going to use classes from the com.google.android.maps package. If you click inside the map, the zoom controls will appear and you will be able to zoom in and out. Our class requires an Android Drawable in its constructor, which will be used as a marker. Additionally, the current Context has to be provided. We use an ArrayList to store all the OverlayItems stored in the specific class, so the createItem and size methods are pretty much self-explanatory. The onTap method is called when an item is “tapped” and that could be from a touchscreen tap on an onscreen Item, or from a trackball click on a centered, selected Item. In that method, we just create an AlertDialog and show it to the user. Finally, in the exposed addOverlay method, we add the OverlayItem and invoke the populate method, which is a utility method to perform all processing on a new ItemizedOverlay. We create a new instance of our CustomItemizedOverlay class by using the default Android icon as the Drawable. Then we create a GeoPoint pointing to a predefined location and use that to generate an OverlayItem object. We add the overlay item to our CustomItemizedOverlay class and it magically appears in our map on the predefined point. Finally, we take reference of the underlying MapController and use it to point the map to a specific geographical point using the animateTo method and to define the zoom level by using the setZoom method. If we launch again the configuration, we will be presented with a zoomed-in map which includes an overlay marker pointing to JavaCodeGeeks home town Athens, Greece. Clicking on the marker will cause the alert dialog to pop-up displaying our custom message. Note: The search framework does not provide APIs to search your data. To perform a search, you need to use APIs appropriate for your data. For example, if your data is stored in an SQLite database, you should use the android.database.sqliteAPIs to perform searches. Also, there is no guarantee that every device provides a dedicated SEARCH button to invoke the search interface in your application. When using the search dialog or a custom interface, you must always provide a search button in your UI that activates the search interface. For more information, see Invoking the search dialog. 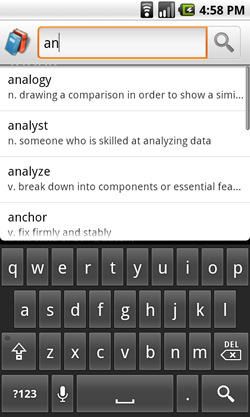 The search framework helps your application provide context-specific suggestions while the user types. Sometimes these suggestions are based on previous searches or other actions taken by the user in an earlier session. A user might not wish for previous searches to be revealed to other device users, for instance, if the user shares the device with a friend. If your application provides suggestions that can reveal previous search activities, you should implement the ability for the user to clear the search history. If you are using SearchRecentSuggestions, you can simply call the clearHistory()method. If you are implementing custom suggestions, you'll need to provide a similar "clear history" method in your content provider that the user can execute. Location and maps-based applications are compelling for mobile device users. You can build these capabilities into your applications using the classes of the android.locationpackage and the Google Maps external library. The sections below provide details. Android gives your applications access to the location services supported by the device through the classes in the android.locationpackage. The central component of the location framework is the LocationManagersystem service, which provides APIs to determine location and bearing of the underlying device (if available). As with other system services, you do not instantiate a LocationManagerdirectly. Rather, you request an instance from the system by calling getSystemService(Context.LOCATION_SERVICE). The method returns a handle to a new LocationManagerinstance. Register/unregister for a given Intentto be fired if the device comes within a given proximity (specified by radius in meters) of a given lat/long. For more information, read the guide to Location Strategies. To make it easier for you to add powerful mapping capabilities to your application, Google provides a Maps external library that includes the com.google.android.maps package. The classes of the com.google.android.maps package offer built-in downloading, rendering, and caching of Maps tiles, as well as a variety of display options and controls. The key class in the Maps package is com.google.android.maps.MapView, a subclass of ViewGroup. A MapView displays a map with data obtained from the Google Maps service. When the MapView has focus, it will capture keypresses and touch gestures to pan and zoom the map automatically, including handling network requests for additional maps tiles. It also provides all of the UI elements necessary for users to control the map. Your application can also use MapView class methods to control the MapView programmatically and draw a number of Overlay types on top of the map. The Maps external library is not part of the standard Android library, so it may not be present on some compliant Android-powered devices. Similarly, the Maps external library is not included in the standard Android library provided in the SDK. So that you can develop using the classes of the com.google.android.maps package, the Maps external library is made available to you as part of the Google APIs add-on for the Android SDK.